Safeguard your lens with the Lens Cover for Nikon 14-24mm f/2.8 AF from LensCoat. This water-resistant neoprene cover is custom-built to fit tightly around your lens, and helps protect it against bumps and scratches that may occur while you are out shooting. The neoprene material also acts as a thermal barrier between your hands and the lens, making operation more comfortable in extreme heat or cold. For simplified operation, the cover features two plastic windows for the distance scale and the auto-focus switch. 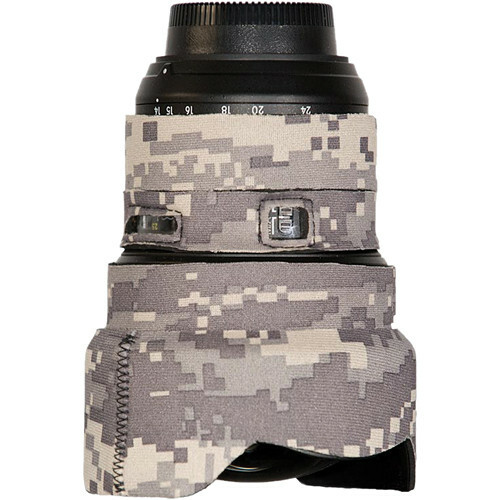 The digital camo color scheme provides a pixelated pattern that mimics naturally-ocurring textures and helps disguise your lens from wildlife. This product is made in the USA. Box Dimensions (LxWxH) 8.4 x 5.4 x 1.6"
Lens Cover for Nikon 14-24mm f/2.8 AF (Digital Camo) is rated 4.0 out of 5 by 4. Rated 4 out of 5 by J Lock from Helpful and Useful The Lens cover is a very easy and simple thing that a photographer can use to ensure his equipment's safety. It will protect from the simple dings and scratches and in my opinion, adds more grip and ease to the product itself. It is very easy to apply to the lens and use. The possible only downside is that when one the lens cap is applied, one must remove the top coating of the cover. Rated 4 out of 5 by Brent from Additional Protection A recent backpacking trek in the Sequoias made me realize my 14-24 f/2.8 lens needed extra protection from scraps and bumps. The LensCoat attaches to the lens easily without any glue. It comes in four pieces: hood, focusing ring, lens body, and zoom ring. I chose not to use the zoom ring cover because I did not like feel when zooming the lens. The hood cover can sometimes slip out of position when attaching or removing the lens cap. I would recommend this product for anyone who takes their gear out into the backcountry. Rated 4 out of 5 by Anonymous from Cloak and... I had a 15mm Nikon wide angle lens years ago and remember how bad I felt when I leaned forward one day and got my first dent in the built-in lens hood! I vowed if I ever got another lens like that, I'd have to get some additional protection. Well this lens coat did the trick. I bought it for the cover portion over the flared lens hood petals. The rest of the coat I decided not to use. I like the feel of the lens rather than it being covered up. Its very nice, well made and definitely adds protection to your investment. Rated 4 out of 5 by Peter from I use most of the pieces Some effort goes into providing windows for the F-stop and distance scales. I do not use that on any of my other lenses with the, coat. Until I can get used to using the lenses with the neoprene covering the zoom and focus rings I will be slowed down a lot. Hopefully the risk/reward of using this product will work in my favor.